A moire effect is created when two similar, but slightly offset, patterns are overlaid. 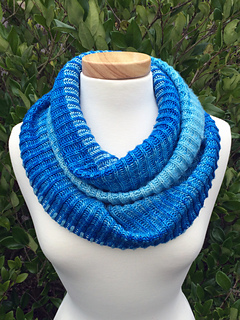 In this cowl, 2-color brioche mimics that effect; the ribs alternate colors, creating an optical illusion of sorts. 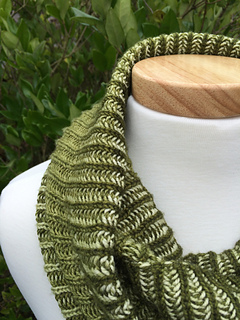 When worked with a gradient set of yarns, the colors blend beautifully, although this cowl would be equally striking in 2 contrasting colors. The fabric created is dense and squishy, yet light. 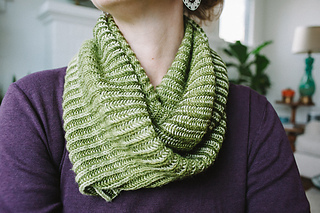 Wrapped about your neck, this cowl will keep you warm and cozy even on the coldest winter day! 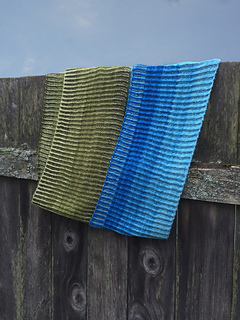 Moire was the featured pattern in the Black Trillium First Quarter 2015 KAL. Looking for the kit? You can find it at Black Trillium Fibres.